I’d like to begin this post by wishing everyone a Belated Happy Diwali. I hope it is a good year filled with fun times ahead. With Diwali nearing, every Indian household kitchen buzzes with energy. Homes are cleaned, utensils are scrubbed and cleaned, dryfruits are stocked up and savories and sweets are made days before the festivities begin. My childhood memories include having Mathri, Shakkarpaare, Namakpaare, Pooris, Chakli, Gujiya, Besan Badam Barfi, Kaju Katli and Sooji Ladoos being made painstakingly by my grandma and Mom. I was assigned the task of crushing dry fruits, cutting the shapes for these goodies. I loved how after sweating for hours on end while making these sweets and savories, it was relished with gusto by the ladies over a cup of masala chai. Ahh Bliss!! I usually try and make these while going back home for Diwali. Last year I managed to make Mathri, Besan Badam Barfi and Ladoos. Being jobless helps at times. This year though I was just able to make some ladoos. Here’s sharing the recipe for them. Excuse the images taken by my humble iPhone4S camera 4.30 in the morning before my flight. Dry Roast semolina on medium heat until it acquires a pale golden color.Ensure that it does not stick to the pan or get burnt. Allow it cool down and powder the semolina slightly. In a saucepan, add around 3/4th of the clarified butter on low heat and add the powdered semolina and cook for 15-20 minutes until it is a beautiful golden color. Add cardamom powder and powdered sugar and mix well for another 2-3 minutes. Keep stirring the mixture continuously, if you feel that you need to add more clarified butter add another 2tsp. Up next add the dried coconut powder and crushed dry fruits. In a different pan, heat 1tsp of clarified butter and add raisins to it. Cook it for 1 minute and it will bloom and this step enhances the flavor of raisins in the ladoos. Add the raisins to the mixture. Blend all the indregeints well and take it off heat. Allow it to cool for a couple of mins. This recipe should give you close to 36 ladoos. Now grease your palms with little clarified butter and start making ladoos. You will be required to apply pressure and lightly roll the mixture. 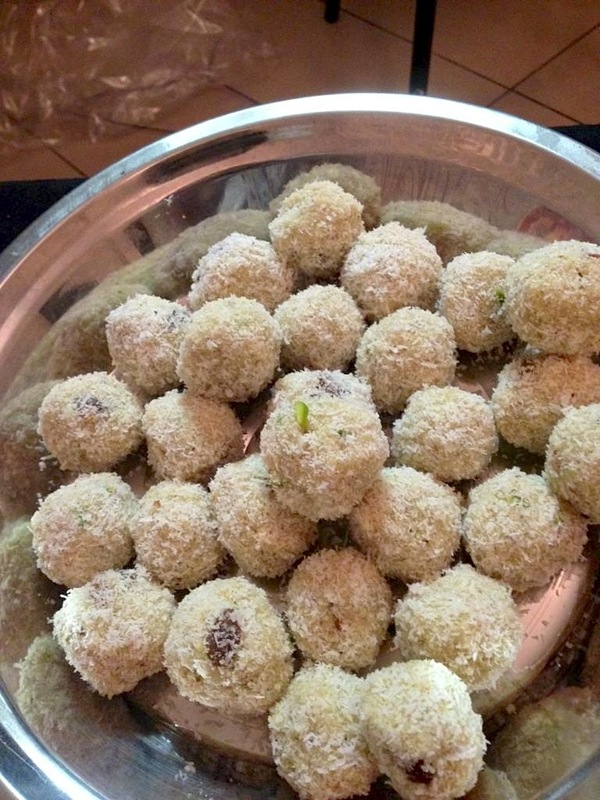 Heap dessicated coconut powder in a plate and roll the ladoos lightly. You can place the ladoos at room temperature in cute looking paper cups. Garnish them with nuts. I have garnished them with pistachios since the green looks lovely against the pale white/ off white of the ladoos. If the mixture does not stick well, heat around half a cup of full fat milk and add the same to the mixture and blend well. You can avoid adding milk as it decreases the shelf life of the ladoos. 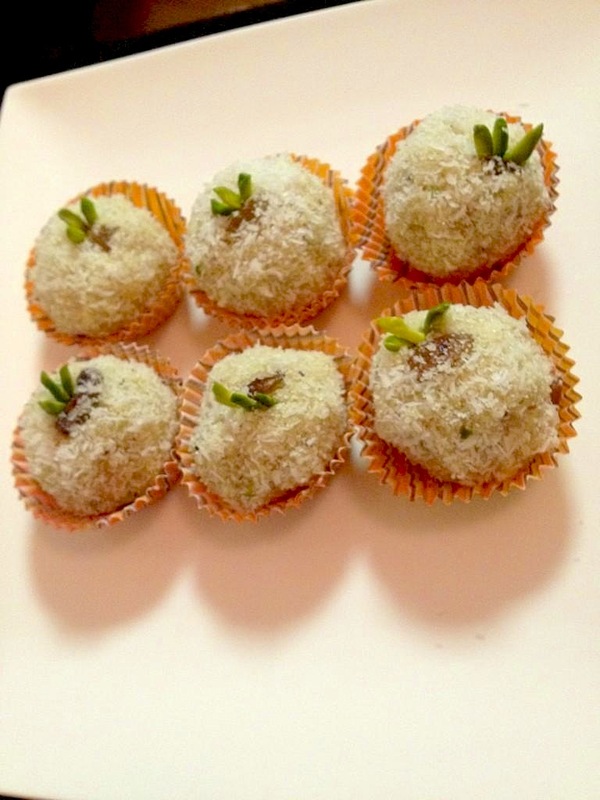 The ladoos stay well for a week’s time if kept in an airtight container. If milk is not added then usually the ladoos last for around 15 days unless they get polished off the plates earlier! !